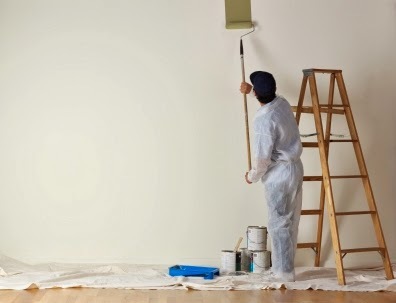 Something I’m passionate about is a smooth, clean, well-painted wall. Crisp lines. Deep color. Vibrant contrast. In such rooms I long to linger. However, my passion is not shared by all in my home. Some have lesser affinity for the beauty of walls done well. Instead, walls are seen as objects for tactile exploration. For teen boys, high-fiving the bulkhead is popular. A good slap, high up the wall, confirms an increasing stature. Those high-fives have left a dirty, and unwelcome, “hey, dad!” greeting on the second floor overhang. Other versions of painted wall abuse include the pin-balling backpack, the shoe shake-and-launch, and the momentum saving turn-the-corner hand grab. Left behind are divots, dings and rubber streaks – evidence of happy children who have passion for things other than pretty walls. Such are the skirmishes with desire that weave their way through the warp and woof of today. We are passionate people. Lines will be drawn on many fronts beyond latex paint. So as I ponder chapter four of his epistle, I observe James arguing toward grace. Grace for what? Our misplaced desires. Desires that result in anti-God allegiances and destructive behaviors. Passions that can metaphorically, or literally, kill. Passions and desires that usurp God’s proper place. In a word, idolatry. And we are all guilty. Grace for when I can’t get what I want. Grace to drown my discontent. Grace to unwind me when tangled in selfishness. Grace to reveal that my desire for perfectly painted walls is a log in my vision that obstructs my view to all but the spec of fingerprints. Many times I’ve stumbled or slipped or even rushed into a tyrannical lecture on the value of a fine paint job. My desires aren’t necessarily wrong. Discussion about the walls in my home should include the issues of respect and stewardship and reasonable behavior. But grace must be the ever-fresh principle that leads to a first place love of God, and a care-filled love of others. Humility. Submission. Gentleness. Forgiveness. Holy antidotes to misplaced passion. The moments of today will be strung between opposing desires. Will I give more grace? Free to not be Free?